Drug prices have skyrocketed and Medicare Part D is an attempt to help Medicare recipients obtain their medicine. Part D has become very confusing and a major component of it is missing at the Medicare website. The missing component at the Medicare website is the PlanFinder. Recipients need to know which insurers will pay for their particular medicines. Not every plan is the same and picking the wrong plan could cost you a bundle. A new treatment for type-2 diabetes may double the risk of death according to researchers at the Cleveland Clinic. If the analysis is correct Pargluva (muraglitazar is the generic name), a drug developed by Bristol-Myers Squibb and Merck & Company, could cause a “public health catastrophe”. The research was published by the Journal of the American Medical Association. Muraglitazar is a new drug used to treat both high glucose levels and improve blood lipids. The drug was approved on October 18th by the Food and Drug Administration (FDA). There may be benefits to the Medicare Part D drug coverage program. Because of the out-of-pocket costs with the new Medicare prescription program Part D, Medicare has already sent letters to people who might be eligible for financial assistance. The extra assistance program is called “Extra Help”. If your resources are less than $11,500 (single) or $23,000 (married) you may qualify for extra help paying for Medicare Prescription Drug Coverage. You can fill out an online application for Extra Help. There appears to be a cure for women with HER II positive breast cancer, which accounts for 20 to 25 percent of breast cancer cases. Women treated with Heceptin had a 46% reduction in reoccurring breast cancer. It is proving to be highly effective against an aggressive form of breast cancer that tends to strike younger women. The New England Journal of Medicine reported that the drug Herceptin, which was licensed only for advanced breast cancer, has effectively targeted a specific protein that halted the spread of the disease. It is becoming more evident each day that your DNA has a lot to with the diseases you get, including cancer, diabetes, and Alzheimer's. Scientists have always wondered if there was a way to change your genes to prevent these illnesses. One of the more exciting avenues in this study is RNA interference (or RNAi). During the 1990's, scientists realized the power of the RNAi technique to determine gene function by blocking the expression of a specific mRNAs. The deadly bird virus H5N1 now has been found in Romania; just two days after Turkey discovered the virus. Research out of the Duke Medical Center may shed light on why it is so hard to keep weight off after dieting. It was found that skeletal muscle tissue and cells from obese people were programmed to store fat even when removed from the body and forced to grow in the laboratory. There appears to be a new reason to eat fish. By eating fish just once a week a person can slow his or her memory loss associated with aging by 10%. By eating fish even more frequently memory loss can be slowed by 13%. Researchers in the U.S. and Australia have discovered a gene that regulates inflammation. They accessed the role of genetic variations in the selenoprotein S (SEPS1, also called SELS or SELENOS), a gene involved in stress response in the endoplasmic reticulum and inflammation control. Officials at the national Department of Health’s report that preliminary test show that a 4 year old Indonesian boy is infected with the deadly H5N1 strain of the avian bird flu. Scientists have discovered that the devastating Spanish Flu influenza pandemic (also known as the H1N1) of 1918 that killed between 10 and 20 million people was caused by a virus that jumped from birds to humans. The virus was significantly different from a normal flu virus and this may explain why it was so devastating. This weekend solicitations will begin for the new Medicare drug prescription plans to be implemented next year. The new program, known as Medicare Part D, will begin on January 1, 2006. There will be over 40 options available to beneficiaries in almost every state. According to the Bush administration most plans will differ slightly from the standard minimum benefit mandated by Congress. There are basically three types of CPAP masks. The most popular is the nasal mask that fits exclusively around the nose. The Full face mask fits around the nose and the mouth, and the new technology incorporates a nasal pillow that actually fits into the nostrils. Each mask has their benefits and problems. Many users of the nasal pillow love the seal. The pillows provide a great seal and the sleeper does not lose that seal when moving from side to side. For people that sleep on their side, this is great. September 13, 2005 (Washington, D.C.) – A day does not pass without families affected by Attention Deficit Disorder reading about the dire consequences and catastrophic results of ADHD. Scan the headlines each day and you’d swear Attention Deficit Disorder were a deadly disease. Kidney failure may have a new treatment soon with newly emerging nano-technology. A nano-technology startup company called Biophiltre is developing a filter that will copy the functions of the kidney. Researchers at the University of Texas (UT) Southwest Medical Center have found a compound that shows promise in treating the spread of Lung Cancer. The team used a compound called GRN163L blocks an enzyme that is known to keep cells immortal. This enzyme has been implicated in almost all types of cancer. "We showed for the first time that this drug can work in animals," said Dr. Jerry Shay, professor of cell biology at UT Southwestern and senior author of the study, which appears in the September issue of the journal Cancer Research. They have determined that GRN163L works rapidly and in doses that would make for a reasonable therapy. What If There Really Isn’t Anything Wrong with ADHD Children? August 31, 2005 (Washington, D.C.) – Robbie Raffino used to rise every day like most eight-year-olds. He’d wipe the sleepiness from his eyes, throw on shorts and shirt that don’t match and eat cereal while watching cartoons. But the innocence ended there. He’d swallow his Ritalin, hop on the school bus and enter a world where teachers, therapists and psychiatrists would try to “fix what is wrong” with him. Children like Robbie—who have tremendous energy, don’t respond to classroom lectures, prefer independent work and are natural leaders—are often diagnosed with Attention Deficit Hyperactivity Disorder. Unfortunately, most “experts” begin with the premise that these children suffer from a disorder, meaning an “abnormal” functioning of the brain. This flawed premise leads to a natural conclusion—that society must change these children to make them learn and behave like everyone else. What If There Really Isn’t Anything Wrong with ADHD Children? Approximately 700,000 spinal bone fractures occur each year. They usually occur in women over the age of 60. Usually the treatment has required the patient to wear a back brace. The patients were also given powerful narcotics to dull the pain. Researchers at the University of Texas Southwestern Medical Center led by Dr. Makoto Kuro-o (M.D., Ph.D.) found that a naturally occurring hormone called Klotho extended the lifespan of mice up to 30%. They also found that it increases the susceptibility to diabetes and decreases fertility. The study was reported in the online journal Science Thursday. In two separate studies there were measurable effects of a weakened immune system by watching violence on television. One study conducted by Duke University reflected that there was an increase in heart rates and blood pressure along with higher stress hormone levels. Originally published in the Medical Tribune in April 2005 issue, the researchers of this study believes that large amount of violence could be cause for major health problems. It's 12:30 a.m and you force yourself off the computer and head for bed. Your alarm will go off in exactly 6 hours so you know you've got to get some good solid rest. Up until the mid 1980's, it was widely believed by physicians and psychologists that ADHD (Attention Deficit Hyperactivity Disorder) was outgrown by the time a child hit adolescence. Surprise! Though many clinicians still hold on to this belief, it is now accepted by many in the medical community that childhood ADHD does indeed continue into adulthood. As a matter of fact, the DSM-IV, the Diagnostic and Statistical Manual of Mental Disorders, describes just that. Attention Deficit Hyperactivity Disorder is estimated to affect 3 – 7 percent of children in the US according to the American Psychiatric Association. Some other studies think that rates for ADHD are much higher. ADHD affects boys three times more often than girls. After calling our new doctor to make an appointment for our child, one of the first questions asked to us is do you have insurance? I think it is amazing to ask, and I wonder what maze of billing that a doctor’s office must go through to get paid. After hearing about the grocery store clerks last year going on strike for 139 days in Southern California for lost benefits due to rises in cost for health insurance, it is not an uncommon trend to pass more financial responsibility to the employee than ever before. The number one reason for doctor visits in the U.S. is pain and nothing else even comes close. The number of people is staggering: 200 million who suffer pain on some regular basis, at least once a month, and 92 million people in unrelenting, chronic pain every day without letup. Researchers at the University of California at Los Angeles (UCLA) reported Monday that they believe that people who die in their sleep may stop breathing because they have lost too many brain cells. They tested Rats and determined that the loss of key brain stem cells may halt autonomic functions such as breathing. Personal scooters are a highly valuable mobility tool for those who, for health reasons, are unable to move around in public or in their own homes. They can ease the burden of having to carry things like heavy groceries or other personal effects. In this sense they can also help people who have back problems and strains. Progresses in technology have made scooters more energy efficient, faster, lighter and more reliable, which means that there are plenty of attractive options available to you should you ever need to purchase one. Prolacta Bioscience of Monrovia California has begun marketing human breast milk. The milk will primarily be used to for sick children, giving them a combination of minerals, digestive enzymes and antibodies. This is believed to be the first time that breast milk has been marketed in such a way. A new study indicates that surgery for a thickened heart muscle not only gives relief of the symptoms, but will also lead to a normal life. Thickening of the heart muscle affects more than 500,000 Americans and is a leading cause of sudden cardiac death in young people. Scientists from the University of Iowa and researchers from Okayama University in Japan have shown a potential method to cure a type of hereditary deafness by stopping the gene that causes the hearing loss. Richard Smith, M.D. research Professor in Otolaryngology at University of Iowa said, "We gave a genetically-deafened mouse interfering RNA that specifically prevents a gene from being expressed that would otherwise cause deafness. By preventing its expression, we prevented the deafness. Even though this is in the early stages, it is really exciting because it points to other options for people who have hearing loss other than hearing aids or cochlear implants." It may be harder to detect a stroke in the right side of the brain than the left because speech is not affected. German researchers, in the July 30th Lancet, report that patients may not be admitted to the hospital promptly because of the difficulty detecting the symptoms. Prompt treatment improves the survival rate during the acute phase of a stroke. This means people that need thrombolytic or other therapies won't get it quickly. Acupuncture can relieve suffering from tension headaches, according to researchers in Germany. The British Medical Journal reports that by applying fine needles to specific body locations cut the rate of headaches in half with 270 test subjects. Most red and white meats are very fatty and are not a healthy way to eat. Seafood on the other hand offers you a great tasting alternative. When cooked correctly you couldn’t ask for a better tasting meal. The Mechanical Engineering Department at Purdue University is developing specialized hydraulic machines and software to test orthopedic devices for the spine. The team is using machines to test spinal implants for the lower or lumbar regions of the spine, and cervical, or neck region of the spine. Ben Hillberry, professor of mechanical Engineering is leading the research and is working with Purpue’s Weldon School of Biomedical Engineering. Ben and his colleagues are attaching implants made by various manufacturers to cadavers and then the spines are tested using a hydraulic machine. Not all benign breast lumps are the same. Most women that undergo a breast biopsy will be told their lump is benign. Researcher in the New England Journal of Medicine compared different types of benign tissue in women. Some benign biopsies resulted in higher risks than others. New research brings hope for early stage Alzheimer’s sufferers. A new mutant protein called tau may be poisoning brain cells in those affected with the disease. It is hoped that future research will create a treatment that blocks tau. Previous research has focused on another protein called beta-amyloid. After this new study published in the journal of Science Thursday, expect research to begin on treatments for blocking tau also. On a sunny April morning back in 1999, I sat down at my desk for the last time in the local Engineering Department. I had been trying to shake a minor headache all morning. Finally, I told my co-workers that I’d have to go home. That’s the last thing I remember for the next four weeks. I don’t recall driving home. I don’t recall being miserable to my family for the following two days. And I don’t recall my own husband taking me to our local hospital’s emergency room, and telling them, “something isn’t right about Wendy.” I was diagnosed with encephalitis… inflammation of the brain. I was whisked into treatment, and my life was saved. Increasing the level of a protein known as hypoxia inducible transcription factor-1 ( HIF-1) in the body. According to the research team white blood cells respond directly to Streptococcus, Staphylococcus, Salmonella, and other bacteria that cause disease in humans, by increasing their levels. 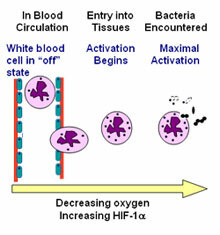 The HIF-1 protein, in turn, stimulates white blood cells to release antimicrobial compounds that kill bacteria. Do you remember the old saying “You are what you eat”? Now it appears you are what you watch also. According to a report out this month in the Archives of Pediatrics and Adolescent Medicine, watching too much TV may lower test scores. In response to the Stanford Gastric Bypass Surgery Study and Heart Disease Risk Article, I’d like to remind your audience that surgery should always be the last resort for any injury, condition, or disease. Obesity is no exception. It’s a mistake for anyone to abandon, or worse, sidestep the proven behavioral solutions of exercise and a balanced diet. The risks of invasive bariatric surgeries (such as gastric bypass, adjustable gastric banding, duodenal switch, etc.) are substantial. And their benefits can be achieved with less cost, no risk, and less aggravation, using natural means. PINON HILLS, CA - It may benefit patients with depression who have suffered a heart attack to take antidepressant medication. This is according to a study at the Stanford University Medical Center. The use of antidepressants may reduce the threat of another heart attack. PINON HILLS, CA - New cases of the West Nile Virus (WNV) are popping up throughout the country. This is a relatively new phenomenon. The Virus has emerged in recent years in temperate regions of Europe and North America (since 1999). The LA Times has reported that there have been two confirmed human cases in California this year. PINON HILLS, CA - The experimental drug glial cell-line derived neurotrophic factor (or GDNF) may give hope to those suffering from Parkinson’s disease. Parkinson’s is a degenerative brain disease. A CPAP machine may lower the risk of death due to heart disease / failure. The CPAP (Constant Positive Air Pressure) machine has been used to treat obstructive sleep apnea (OSA), and now a new study indicates it may help reduce the sympathetic nervous system activity in the morning. There are various manufacturers including , Respironics, GoodKnight and others. The study was carried out by physicians and researchers in Toronto Canada.. Complete Article. Pinkeye is an infection or allergy of the conjunctivae (kun-junk-te-VI-tis). The conjunctiva (or thin membrane covering the white of the eye and the inner surface of the eyelid ) is the outer lining of the white part of the eye. The inflamed conjunctiva will usually make the eye appear red or pink because the tiny blood vessels that are normally within the conjunctiva are now irritated and enlarged. Conjunctivitis is highly contagious -– and tends to be prevalent in daycare centers and schools -– spreading by direct person-to-person contact, in airborne droplets that are coughed or sneezed, or from sharing makeup, towels and washcloths.